An eye-catching design brings people to the table. Complete your trade show marketing kit with the addition of printed tablecloths. Get your message across even from a distance. Our tablecloths are printed on 8.8 oz. polyester fabric that easily slips over any 6’ or 8’ table. A trade show staple, tablecloths (otherwise known as table runners) spotlight your business while hiding the clutter underneath. They make your booths much more presentable. Tablecloths let you maximize what little space you have. Even if you store your products, personal belongings, and marketing tools underneath your custom printed table throws, passersby will never notice the mess underneath. Ready to print? Upload your design to begin. Where will my graphics be placed? 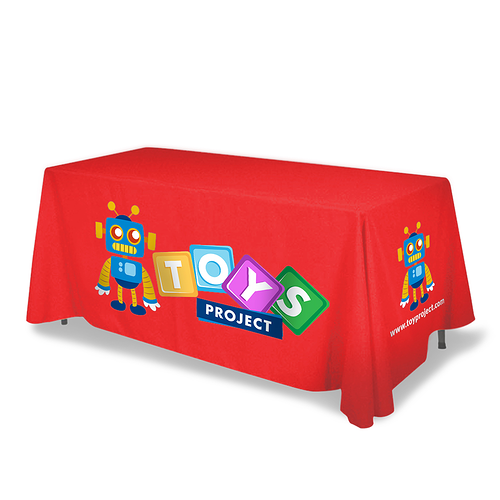 Your graphics (design) can be placed anywhere on the front of the tablecloth (maximum graphic size of 152” x 87”). The sides, top, and back will not have any printing. What’s your turnaround time on tablecloths? It takes 5 working days to print your custom tablecloths. Turnaround time does not include shipping time. Is graphic size the same as table size? No. Graphic size refers to the design to be printed like your business logo. We currently offer tablecloths that fit 6’ and 8’ tables. What’s the difference between 3-sided and 4-sided tablecloths? The 3-sided and 4-sided options do not refer to graphic placement but to the style of the tablecloth. 4-sided covers the entire table. 3-sided leaves an opening at the back of the table for easy access to stuff underneath.